“Dr. Oral Roberts, a legendary evangelist who rose from humble beginnings to become one of the most influential Christian leaders of the 20th century, died today in Newport Beach, Calif., due to complications from pneumonia,” a press release issued by his ministry announced Tuesday. “On Saturday, December 12, while in his home in California, Oral Roberts slipped and fell,” reported the ministry of the 91-year-old televangelist in a statement released Monday. “He was transported to a local hospital and is currently being treated for broken bones and a slight case of pneumonia. Doctors report he is in stable condition,” added the ministry, which is presently being led by Roberts’ son, Richard. Tulsa World mentioned some controversies which surrounded Roberts. In 1977, Roberts told his partners that God had told him to build a medical complex that would merge “the healing streams of prayer and medicine.” Construction of the $150 million City of Faith complex began in 1978. A $25 million debt forced the closing of the City of Faith and its medical school in September 1989. Early in 1987, Roberts touched off another controversy by announcing on television that if he did not raise $8 million for medical students’ scholarships so they could become missionaries, he would die by the end of March. After the announcement, a few television stations refused to air the broadcasts. Roberts received the needed money, including $1.3 million from a dog track owner in Florida, before the March 31 deadline, and he proclaimed victory in the campaign. There will be a private family internment. Arrangements for a public memorial service in Tulsa are pending and will be announced soon. “Oral Roberts was the greatest man of God I’ve ever known,” Richard Roberts said. “A modern-day apostle of the healing ministry, an author, educator, evangelist, prophet, and innovator, he was the only man of his generation to build a worldwide ministry, an accredited university, and a medical school. “Beloved husband, father, grandfather and great-grandfather, he was not only my earthly father; he was my spiritual father and mentor. The last member of his generation in the Roberts family, he had a passion to bring healing to the sick. Granville Oral Roberts was born into poverty in Bebee, Okla., on Jan. 24, 1918. He began stuttering as a young child and then, as a teenager, contracted a potentially deadly case of tuberculosis. Bedfast at 17, he was carried to a revival meeting by his older brother, where a healing evangelist was praying for the sick. Roberts was miraculously healed of tuberculosis and stuttering at the revival meeting. His healing ministry was born several years later. “If a former stuttering, tuberculosis-ridden young Indian boy in an obscure county in Oklahoma can see the invisible and do the impossible—and still do it—so can you!” Roberts once said. Roberts was a legendary and beloved figure in a segment of Christianity that emphasizes healing, speaking in tongues, and other gifts of the Holy Spirit, as described in the New Testament. After his healing at age 17, Roberts spent a dozen years pastoring churches in Oklahoma and Georgia, and preaching at revivals around the country, while also studying at Oklahoma Baptist University and Phillips (Okla.) University. Then, in 1947, he founded Oral Roberts Evangelistic Association (OREA) and began conducting crusades across America and around the world, attracting crowds of thousands—many who were sick and dying, and in search of healing. Through the years, he conducted more than 300 crusades on six continents. OREA officials estimate that he personally laid hands in prayer on more than 2 million people. The ministry continues under the leadership of Roberts’ son, Richard, who has ministered in the U.S. and around the world for almost 30 years. In 1954, Oral Roberts revolutionized evangelism by bringing television cameras into services, providing what he liked to call a “front-row seat to miracles” for millions of viewers. 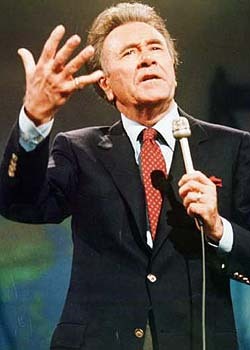 Years later, he began a television program, “Oral Roberts Presents.” More than 50 years later, the ministry’s daily program, “The Place for Miracles,” continues to minister to millions on over 100 television stations, multiple cable and satellite networks, and can be seen around the world via the Internet. In 1958, Roberts founded the Abundant Life Prayer Group to address the around-the-clock needs of those suffering and requesting prayer. More than 50 years later, prayer partners continue to receive calls from around the world seven days a week, 24 hours a day. Over the years, they have received more than 23 million phone calls for prayer, along with astounding reports of miracles in answer to prayer. Roberts answered God’s call to build an institute of higher learning in 1963, founding Oral Roberts University on 500 acres in Tulsa, Okla. Longtime friend Billy Graham officially dedicated ORU four years later. In the 1970s graduate schools, including Medicine, Nursing, Dentistry, Law, Education, and Theology, were added. Roberts served as school president until 1993, when he became chancellor. In 1981, Roberts founded the City of Faith Medical and Research Center, merging the healing power of medicine and prayer. The facility closed after eight years, leaving a lasting impact on the understanding by many medical professionals of the importance of treating the whole person—body, mind and spirit. Roberts wrote more than 130 books, including such classics as “If You Need Healing, Do These Things,” and “The Fourth Man.” His book “The Miracle of Seed Faith” has more than 8 million copies in circulation. This book’s key principles—God is your Source, sow your seed out of your need, and expect a miracle harvest—formed a fundamental part of Roberts’ ministry and legacy. Roberts was preceded in death by his wife, Evelyn, a daughter and son-in-law, Rebecca Ann and Marshall Nash; a son, Ronald David Roberts; a grandchild, Richard Oral Roberts; his mother and father; two sisters, Velma Roberts and Jewel Faust; and two brothers, Elmer and Vaden Roberts. He is survived by a son and daughter-in-law, Richard and Lindsay Roberts; a daughter and son-in-law, Roberta and Ronald Potts, all of Tulsa; as well as 12 grandchildren and several great-grandchildren.